The highly-anticipated Keystone State Clash lived up to its billing. It was looking as if the headlines would be about a Jess Kovatch-led road win over the defending champions, but there were still 3:12 remaining. Becoming the first NEC athlete to eclipse the 40-point mark this season, Kovatch buried a triple to run her single-game total to 42 points while bumping the Saint Francis U’s lead to 60-54. Then, the Robert Morris defense, which leads the league in two major categories, clamped down. The Colonials allowed only an Ace Harrison layup over the final 3:12 and found themselves facing a 62-60 deficit with time for one final possession. 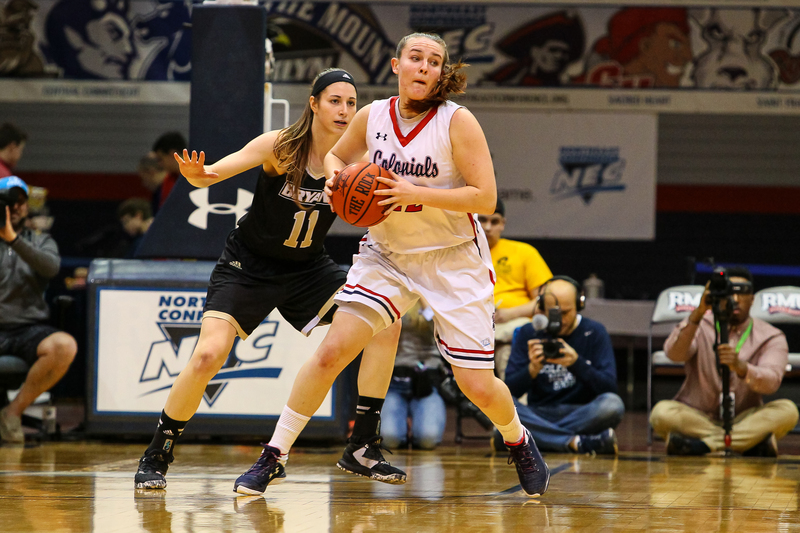 As the seconds ticked away with RMU controlling the ball in the frontcourt, Nina Augustin found senior Megan Smith who buried a buzzer-beating three-pointer. The dramatic 63-62 victory was the Colonials fifth win in a row and the team’s 10th in its last 11 outings. The defending champions now stand alone atop the NEC standings at 5-0 with SFU (4-1) sitting 1.0 game back in second place. These two rivals will meet again in Loretto on February 3 in what will be the featured #NECWBB Game of the Week on ESPN3. They have split the regular season series each of the past four years.